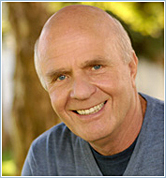 I've been a huge fan of Wayne Dyer for 20 years, beginning with his classic best-seller, Your Erroneous Zones (1993) and including many of his dozens of books. I always had the sense that he was a truth-teller who was telling me the truth. Maybe it's because he's an outsider who speaks his mind - a candid, self-effacing man whose life exemplifies that you never stop learning and you don't have to be perfect to be wise. Maybe it's because he talks about spirituality and religion as two separate things. In any case, he always made me think and I've incorporated a lot of his wisdom into my own thinking. When he speaks, I listen; and I'm always rewarded for it. On COMMITMENT - "There's no scarcity of opportunity to make a living at what you love. There is only a scarcity of resolve to make it happen." On PERSEVERANCE - "It's never crowded along the extra mile." On RESPONSIBILITY - "How people treat you is their karma; how you react is yours."